Joachim Vogel Masters of Rhythm Guitar PDF + Mp3 CD download. This book and CD set presents rhythm concepts and techniques for rock, blues, soul, funk, reggae, jazz and country guitar. It includes more than 200 grooves in the styles of Scott Moore, Keith Richards, Jimi Hendrix, Steve Stevens, James Hetfield, Prince, Bob Marley and other famous guitarists. The aim of this book is to expand the player’s repertoire of authentic rhythm grooves in a number of popular styles. Using examples of playing styles of various influential guitarists, the author illustrates their characteristic sounds, playing techniques and harmonic approaches. This, combined with background information and a discography, will provide you with a comprehensive view of the work of each guitarist. This book should serve as a reference work which you can draw on as you need or choose to. In notation and tablature. 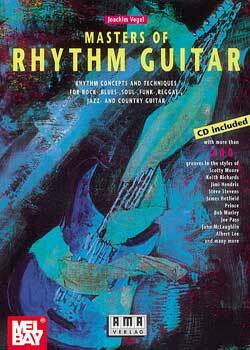 Download Joachim Vogel – Masters of Rhythm Guitar PDF free and other books from our site. Only high quality PDF scans. Please write a review, it's important for our community.